German Shepherd Dog is probably one of the few dog breeds that have most varied range of coat colors and patterns. White German Shepherds unfortunately got exposed to some misconceptions that have restricted the popularity of these pure breed beautiful German Shepherds. Here are some of the misconceptions about the white German Shepherd Dogs and the specific gene that is responsible for expressing this particular coat color. White color in German Shepherd Dog is a result of gene dilution or partial albinism. comparative analysis of the dog genome, findings from the most contemporary research on genetics of White German Shepherds and specific breed DNA sequences have shown that this is pure gene. There's nothing to consider White German Shepherds as result of color dilution or paling for the whole GSD breed. It is only when the recessive allele is genetically transmitted from each of the breeding pair parent, the e/e genotype offspring of white German shepherd parents, always have cream or white colored coat. 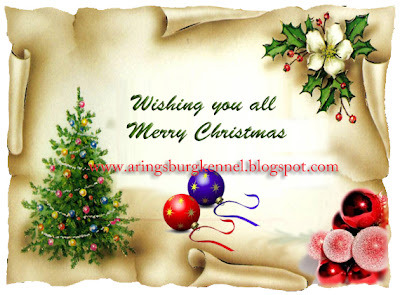 Merry Christmas and a Happy New Year too all German Shepherd Dog Lovers around the world. We are highly honored to have such nice people like you as our readers.We shall deem it to be ever grateful to have this beautiful relation maintained all through. Our heartfelt wish too all of you and your loved ones and your beloved German Shepherds.